I always walk by pipe cleaners in craft stores and think, “There’s gotta be a way to make those not look like they are meant for only 4 year-olds.” Well, I think I may have found an answer as wrapping devices. They are perfect for braiding and twisting (and you’ll learn how to braid five ways. Yipeee!). Chosen well and the colors can mimic a beautiful autumn harvest. I added some gift tags into the braiding for an extra bit of spice. Step 1: Let’s learn to braid five with five strands. It’s a great way to add lots of color to a simple braid. It’s super easy by just remembering the “3 to 2″ rule. First, start off by pinching them together at the top. You can also set them under something heavy to weigh it down. Split one group into three and the other into two. Take the outside strand of the three group to the inside of the two group. Now, take the new three group and take the outside strand to the new inside two group. Keep on going by switching off “outside three” to “outside two” and so forth and soon you’ll see a braid developing. 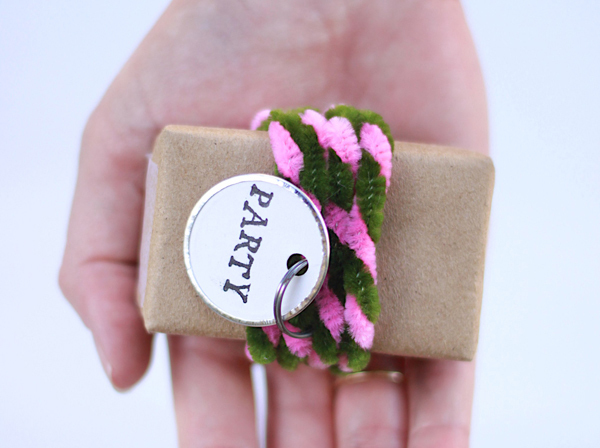 Step 2: Halfway through your braiding, take the gift tag and slide it into the braid where you’d like it to be seen from the top of the package. Continue to braid until you reach the end. You don’t have to secure the ends because the wire will keep them in place. 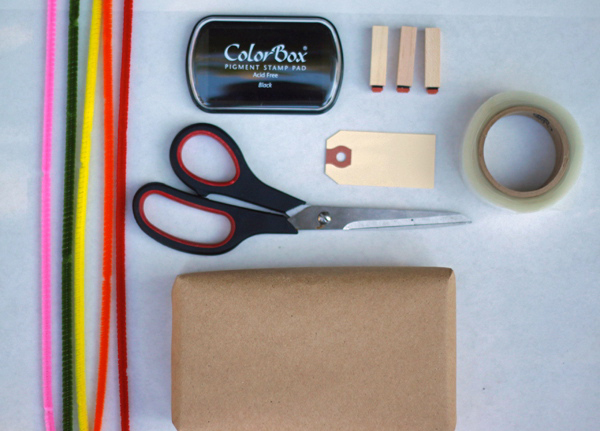 Step 3: Glue the ends to the bottom of the box and hold to secure. 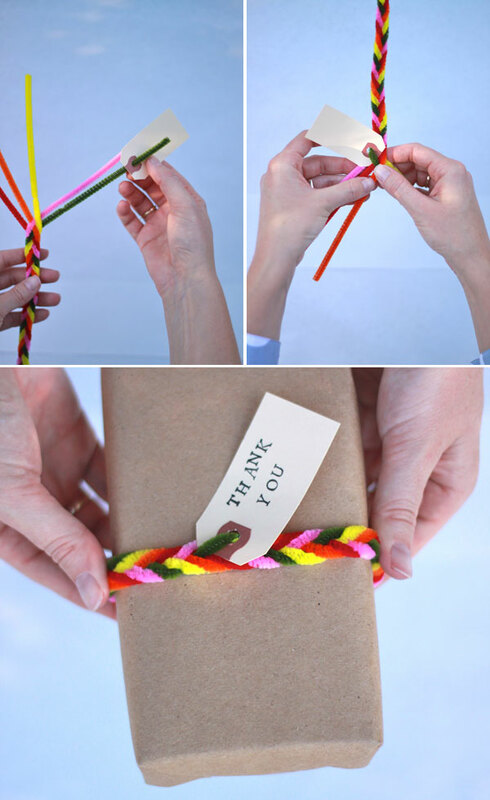 You might want to bend the wires of the pipe cleaners to ensure a secure an easy shape to the box. Get clever with the braids by adding two together in an “x”, try twisting just two colors, or try a simple 3 way braid and you’re good to go! Happy harvesting! I havcn’t used pipe cleaners or even said pipe cleaners since 1985. now i need them, this is too cute. All of my years of friendship bracelets and this is the first five-strand braiding I’ve seen. I was really missing out. Thanks! I’m always drawn to the big, bright packages of these in the craft store. The only thing I’ve ever done with them is make candy-canes as a kid! Very clever. such a smart and easy idea!! This really made me smile, I love it! I have decided to wrap all my presents in brown paper this Christmas- this will go perfectly. 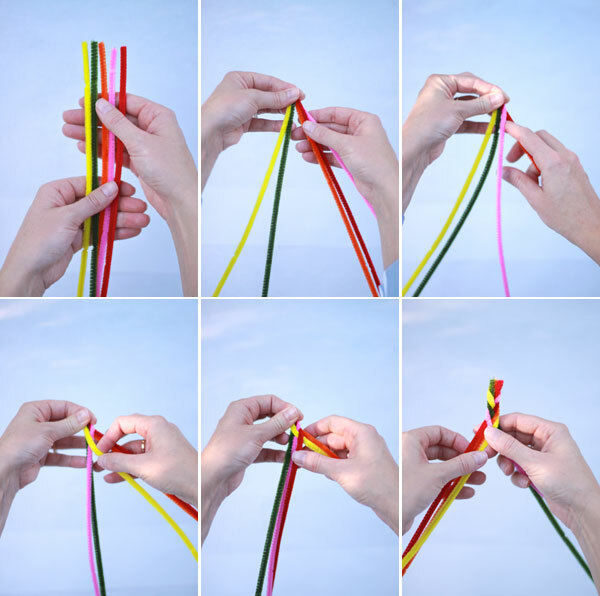 Where can I buy pipecleaners in Paris!? wow – I know what my Christmas gifts will look like, thank you! So cute and colorful! I was going to buy pipecleaners for the first time, ever, for a little project for my kids and now I’m really excited about everything else I can do with them! Love love love this!!! 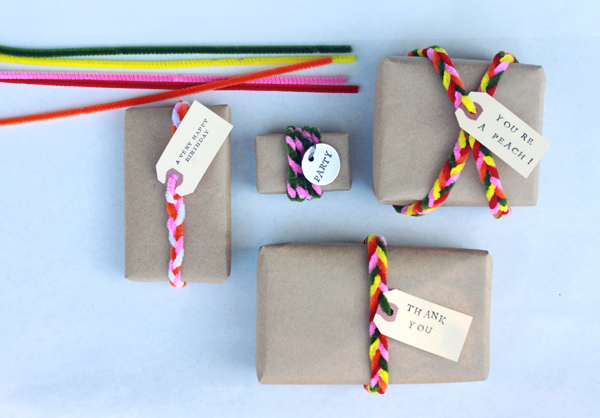 Especially the colorful braided ones against the plain brown wrapping!! Very clever and will be my new wrapping! Thanks! hello, love your ideas, can I use your pictures, giving you credit and linking to your page of course! Honestly, I use pipe cleaners for everything! I even mounted pelmet boxes to the wall using them (you’d never know!). This is so clever and affordable. We are on such a tight budget this holiday season and it will be so nice to be able to wrap little things up with love! Love that 5 strand braid! We are never without pipe cleaners of various sizes in our household – and color coated wire as well – as this kids are masterful at creating the unexpected with them. Amazing project! I just love it! Pipe cleaners are so fun! I definitely will try this out when I’m wrapping gifts! I have loads of pipe cleaners..I have a 4 year old daughter who loves to make things with them! I have never thought of using them to wrap presents before so thanks for the inspiration..these ones look great! Filminho « Buenos Aires, queridos.